Baboom, here we are at Ribbon Records. They’re located in the old Murray’s building on Walnut Street. I used to work here back when it was Murray’s Department Store in 1980 and we stopped in this building way back when I first started this blog. When the store was first opened it was only open on Saturdays, now it’s open on Wednesday, Friday and Saturday. Friday they’re open till 9PM and I wonder if they ever have some sort of drinking party going on at night? I have to work Friday nights so I’ll never know. Sob! I remember these doors well! Let’s go in and see what’s spinning at Ribbon Records. Wow, the first thing that I notice is that this place is huge! It seems to have grown since the last time I was in here three years ago. The second thing I notice are these two people standing there probably thinking: "Who’s this clown with the camera?" This is Matt and Jenny. Jenny is the owner, she took it over in 2012 and expanded it from just a used record store to a full-blown vintage store stocked with records, clothing, art, furniture and accessories. Matt is the self-designated, “Record Guy” who runs the front of the store. As you can see by this cool chair over here, there’s more than just records to look at in here. There’s also stereo equipment and vintage and state of the art turntables on display. And lots of books to thumb through. Looking at this collection of books brings back Twilight Zone memories. Stacks of 45 records and cassette tapes piled above them. The cassettes put me in a Bow Wow Wow mood. Wow, check out The Runaways picture disc. I’ve never seen this one, poor Joan Jett, she’s got a hole in her cheek! Matt told me that some of the more collectible items are hung up on this wall of albums over here. There’s the original Velvet Underground album with the cover that was designed by Andy Warhol. I love these old ‘60’s albums with the schticky humor covers! Check out the Yardbirds, “For Your Love,” album. Brings back memories of the show that happened just a couple weeks ago! Ha ha ha! This is one of the greatest album covers of all time! “Songs For Swinging Mothers.” This would’ve been a great Mothers of Invention album cover! But there’s also a lot more as you can see from the front case area. I could probably spend the rest of the day over here looking at all these cool items on display. Party Baby! (Private MySpace joke alert! Yes, I said, MySpace! Remember ThatPlace?) Only a few will get this reference, but those that do will really get a kick out of it...you out there Tiki Bar Susie? This mannequin is from 1940! And yes, I’m trying to look up her sun dress, you got a problem with that? I love this Koala bear lamp. They just got this 1962 Broyhill Brasilia China Cabinet in last Sunday. It’s in great shape and there’s also a matching dining table and four chairs that can be purchased with it. Jenny said several people have already shown an interest, so if you want this, you should call or stop by soon. There’s more information about this and other items on their facecrack page. If you look around, you’ll notice that there’s quite a few owl items for sale in here. Jenny told me she used to collect owl artifacts and her collection once totaled over 300 owl related items and some of them are for sale in here. What a hoot! More unique lamps and a vintage TV set are on display on a shelf up below the high ceilings in here. I spy two more owls on these shelves. Check out The Monkees hand puppet, I’ve never seen one of those before! Jenny and Matt said that it’s hard to come by vintage concert t-shirts these days, so this Genesis shirt is a real find. Mama! I forgot all about that song...now it’s stuck in my head for the rest of the day. Aaaahhh! I decided to get the Best of Herman’s Hermits. 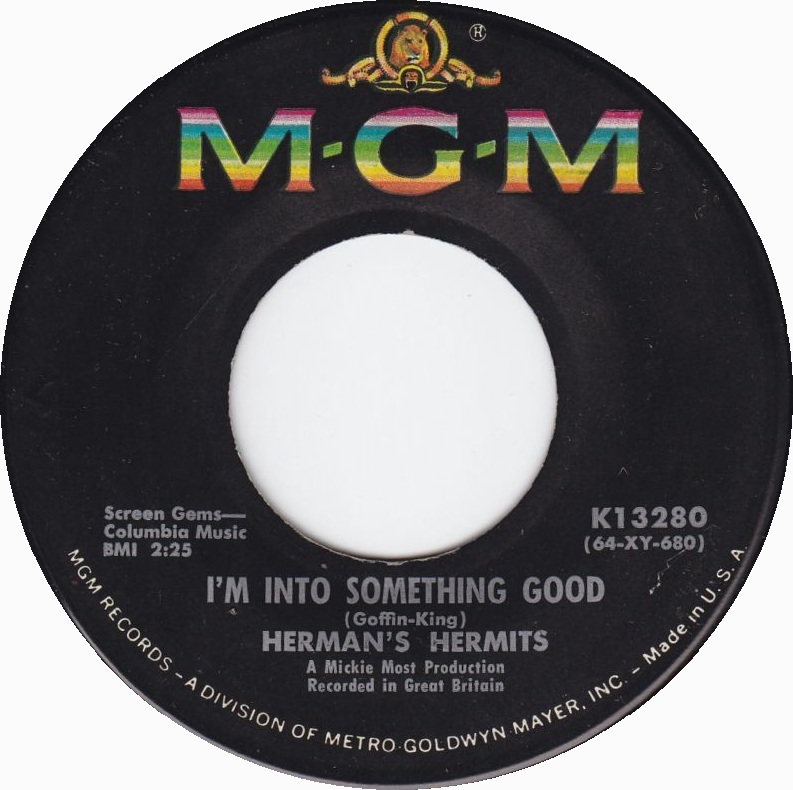 The Best of Herman’s Hermits was the first album I ever bought, it was different collection, but this still brings back nice memories. As Jenny was ringing the album up we started talking about Mad Magazine and Matt brought out this Spike Jones album with artwork by Mad artist, Jack Davis. Very cool! And it’s time for me to hit the road. If you’ve never been to Ribbon Records you should definitely check it out, it’s loaded with one-of-a-kind merchandise and Matt and Jenny are cool and interesting people that are fun to hang out with as you shop. We’ll see you all tomorrow! Open: Wednesday - 11AM to 7PM, Friday - 2PM to 9PM and Saturday - 11AM to 7PM. Related Posts: Shop Hop @ The Costume Trunk, Julie’s Corner Store and Moxie’s ReSale Boutique. Today’s post was brought to you by New Amsterdam. Check them and all the other fine businesses helping to support this blog over at the MBIP Bucket List Page. Your Daily Random Linkage awaits you at the bottom of the that page as well!